The AccelTex Solutions dual band indoor/outdoor patch antenna is a perfect complement to any enterprise-class wireless access point to achieve directional coverage in your indoor or outdoor space. 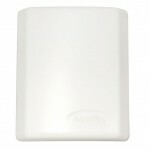 Each antenna element is optimized for Wi-Fi operation on both 2.4 and 5 GHz. The antenna’s come with an articulating mount allowing for adjustments in the horizontal and vertical orientation of the antenna’s to meet your coverage and performance needs. Click on a product category below to learn more or contact us today on 1300 WiFi 000.